Comparative Federalism: A Systematic Inquiry, Second Edition is a uniquely comprehensive, analytic, and genuinely comparative introduction to the principles and practices, as well as the institutional compromises, of federalism. Hueglin and Fenna draw from their diverse research on federal systems to focus on four main modelsAmerica, Canada, Germany, and the European Unionbut also to range widely over other cases. At the heart of the book is careful analysis of the relationship between constitutional design and amendment, fiscal relations, institutional structures, intergovernmental relations, and judicial review. 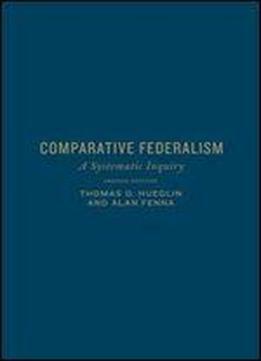 Such analysis serves the dual role of helping the reader understand federalism and providing a comparative framework from which to assess the record of federal systems.The second edition has been extensively revised and updated, taking into account new developments in federal systems and incorporating insights from the growing body of literature in the field. It includes two new chapters, "Fiscal Federalism" and "The Limits of Federalism."